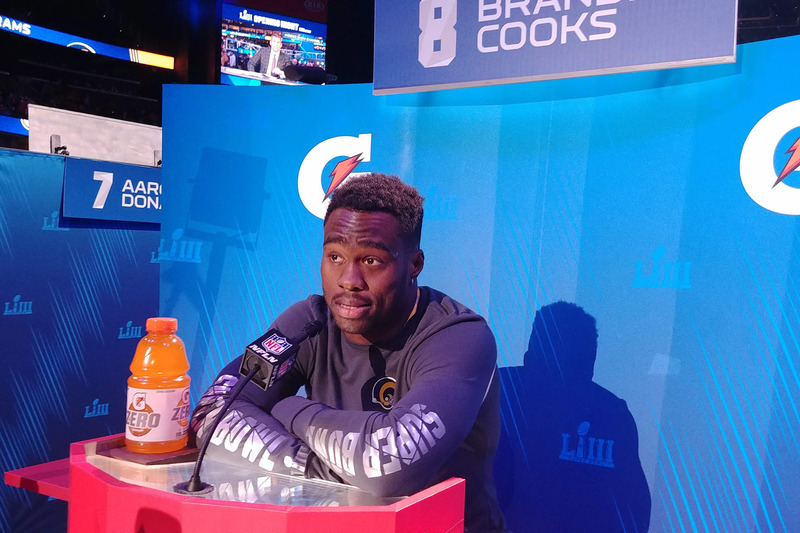 ATLANTA (BP) -- For Los Angeles Rams wide receiver Brandin Cooks, Sunday's Super Bowl is an opportunity for redemption. Cooks was part of the New England Patriots in last year's Super Bowl but left the game prematurely in the second quarter with a concussion. He never returned to the game, which the Patriots lost 41-33 to the Philadelphia Eagles. "I've asked God to redeem me since that moment," Cooks said in a post-game interview following the Rams' NFC Championship victory over New Orleans. "I'd always pray, from that moment, to redeem me in such a way to glorify Him. And I think He's doing that." A spiritual leader for the Rams, Cooks is always quick, whether in interviews or on social media outlets, to offer praise to God and to regularly quote from the Bible, which he says is "what's gotten me here." "Like Paul said in Philippians, I know what it is like to be in need, to have want, to have everything," Cooks told Baptist Press during Monday's Super Bowl LIII Opening Night event at the State Farm Arena. "I can do all things through Christ who strengthens me. I know that's why I'm here to this day and been blessed with such an amazing gift to play this game -- not for myself, but to give God glory." "Let us turn our eyes to Jesus so that the desire of this world may grow dim." "Seek and serve others not for our own benefit but to bring glory to God." "Deny yourself, and take up your cross!" "When others see me I pray they miss me and see you Jesus." "Saved through the one and only Jesus Christ." For his teammates, Cooks' addition to the team this year has meant a great deal. "Brandin's been a spiritual spark to this team," Rams punter Johnny Hekker said. "His faith is no secret to anybody." "He's an inspiration to a lot of the young guys, and a lot of the older guys as well, because we all have our own walks of faith," Saffold said. When Hekker thinks of Cooks' spiritual leadership on the team, he thinks of how he regularly sees Cooks sitting at his locker with his Bible open or kneeling in prayer. Said Hekker: "The kind of example he sets makes it easier for guys like me and anyone around our organization to get that reminder, 'Maybe it's time for me to crack open my Bible as well.'"